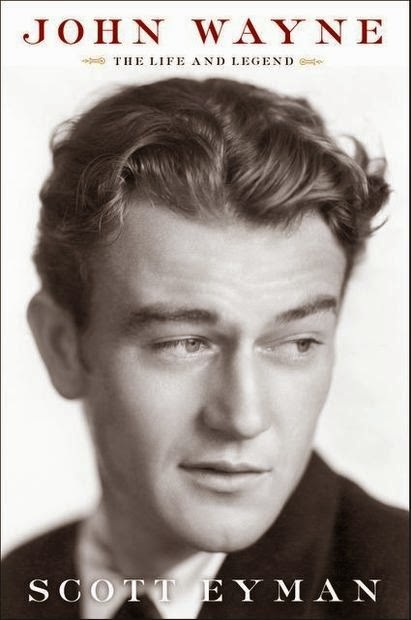 Paul Davis On Crime: John Wayne Biographer Scott Eyman Talks About "The Duke"
John Wayne Biographer Scott Eyman Talks About "The Duke"
Scott Eyman, the author of John Wayne: The Life and Legend, is interviewed in the Broward/Palm Beach New Times about the late great iconic actor. Eyman's love of old-school Tinseltown illuminates his first post-Post tome, a sentiment equaled only by the deep empathy evident in his appreciation of the book's subject, actor and icon Marion Michael Morrison, aka John "Duke" Wayne. ... Wayne's stature is undeniable. He was a movie star whose celluloid trail through the Old West and World War II's Pacific theater lifted his stardom into the constellation of American myth: Washington crossing the Delaware, Lincoln at Gettysburg, the flag at Iwo Jima, the Duke and his firearms enforcing eternal verities. Eyman's John Wayne: The Life and Legend is the work of a master biographer. Exhaustively detailed (five years in the research and writing), its impeccable prose unspools an effortless narrative flow packed with tasty anecdotes (Wayne and Marlene Dietrich had a years-long affair? Who knew? ), keen observations about our hard-working hero's pained personal life, his self-creation (the honorable-tough-guy image resulted from finely crafted acting within a self-limited range of characterization), and the mechanics of moviemaking.